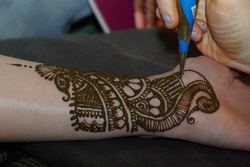 I've worked all over the World Applying Henna at Weddings, Festivals and Asian Mela's. Even teaching at Schools, Colleges and Charitable Societies. The whole lot you name it i've done it !! I decided on a Online Course so it could reach out to everybody and anybody regardless of their location to be practiced in the comfort of their own home. I will teach you exactly WHAT I DO TODAY and have been doing for approximately 14 years i have literally turned a hobby into a proper income generating tax paying business it's an amazing feeling getting paid for something which was a hobby and i truly love doing. The module pages can only be accessed via a Password that you will receive by email following receipt of your cleared payment once you have purchased the course. ​You will receive the password within 24 hours of your purchase. (But please one last note before i depart Earnings Disclaimer this is not a get rich scheme in any shape or form and neither does participating on this course guarantee any financial reward or benefit to you. It is a unique, beautiful art which does require work and dedication from you but if you are passionate like me then who knows the choice is yours ? ​So what are you waiting for click the BUY NOW CLICKBANK Link Below to start your Henna Course.